We made the most amazing blueberry buttermilk muffins over the weekend, you have to try this Ina Garten recipe. 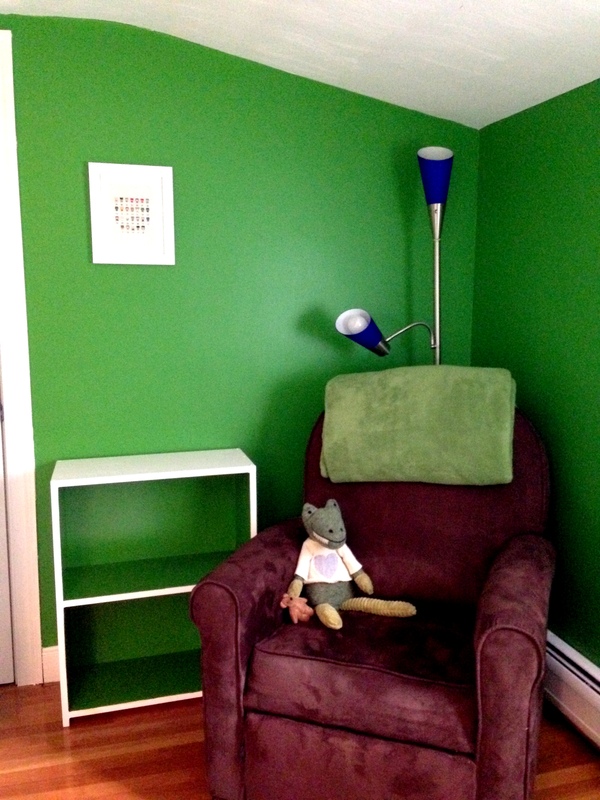 Z likes to join us as we read the Sunday paper – she is perusing the Toys R Us ad here. This little girl is always up for shopping! 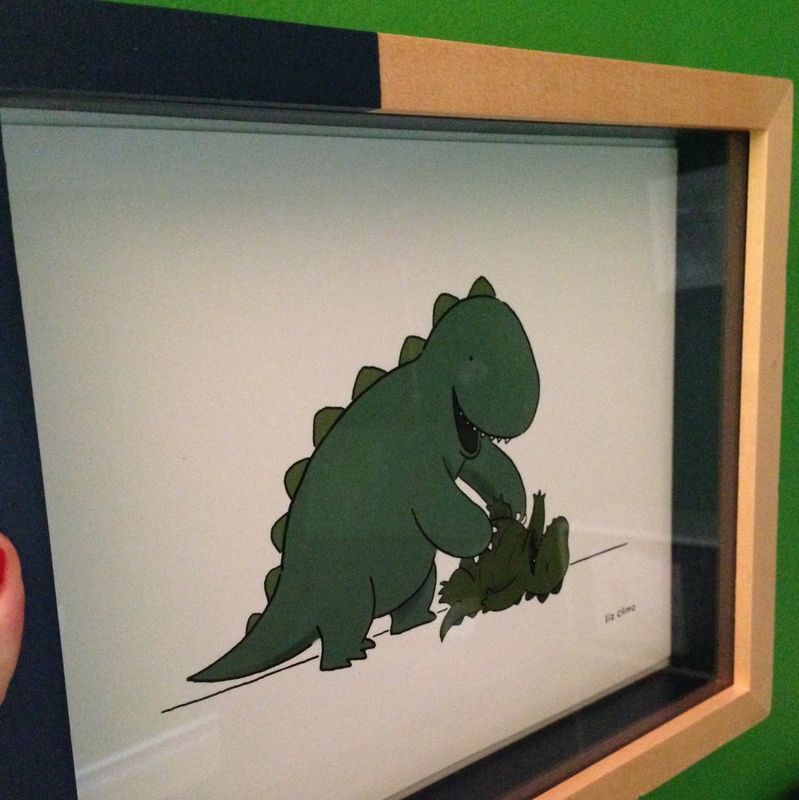 A close-up of the “Tickle Monster” print we’re going to hang in the baby’s nursery. I always remember my mom putting little vases of lilies of the valley on the windowsill growing up so I decided to do the same now that we have them growing in our yard. She can’t help but try on shoes at any store that has shoes out (as seen here as well). She does always have good taste though, these striped wedges are perfect for summer. Have a great weekend – we’ll just be sitting around waiting for this baby to arrive! Since I got such fun feedback from my last What Z Said post, I thought I’d put together another because Lord knows she is full of saying funny things right now! I confirmed with you yesterday that we’re having a baby boy! Z understood this (as much as she can) until a couple months ago she changed her mind and started saying “Baby sistah” when we was asked what kind of baby we’re having…uh-oh! 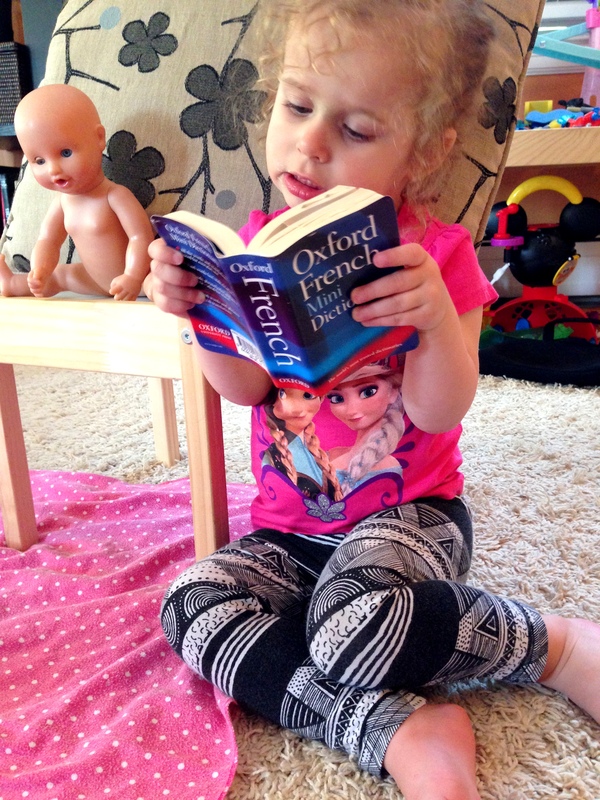 And yes, in the photo above she is reading her baby doll a French dictionary. That’s my girl! HELLO! 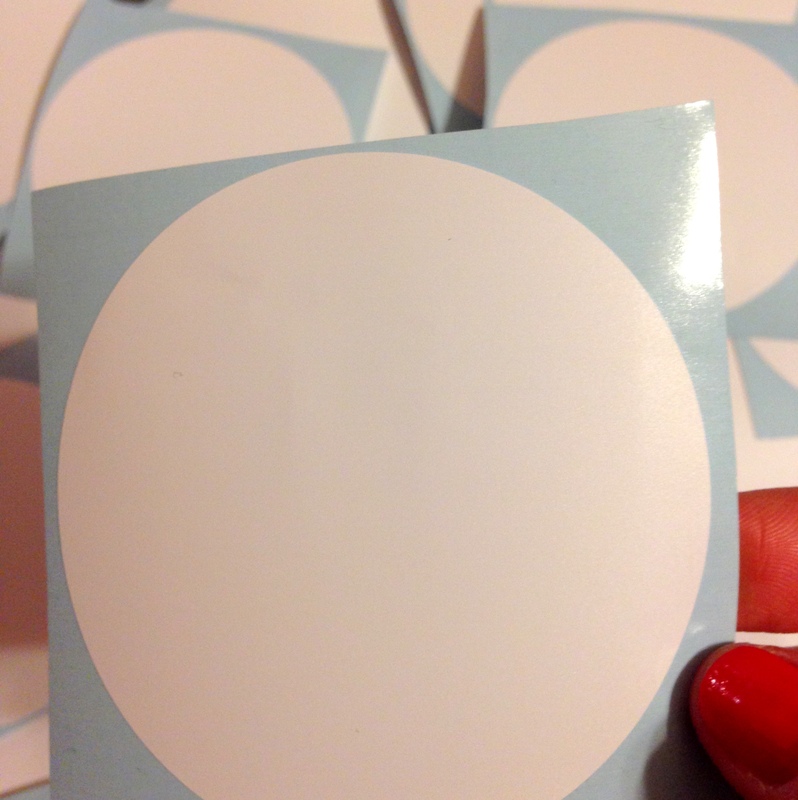 I have been a bad blogger this week, I know… I’ve just been, well, super duper crazy giant pregnant. It’s been a week of exhaustion, pain, random contractions, and all sorts of other end-of-pregnancy fun. So! That said, I had every intention of sitting down and constructing a few posts but it just never happened – that time was spent catching up on sleep instead. But here I am at the end of the week with no new baby and a phone full of photos from our week SO I thought I’d still share my usual Friday post. I hope everyone has a great weekend!! 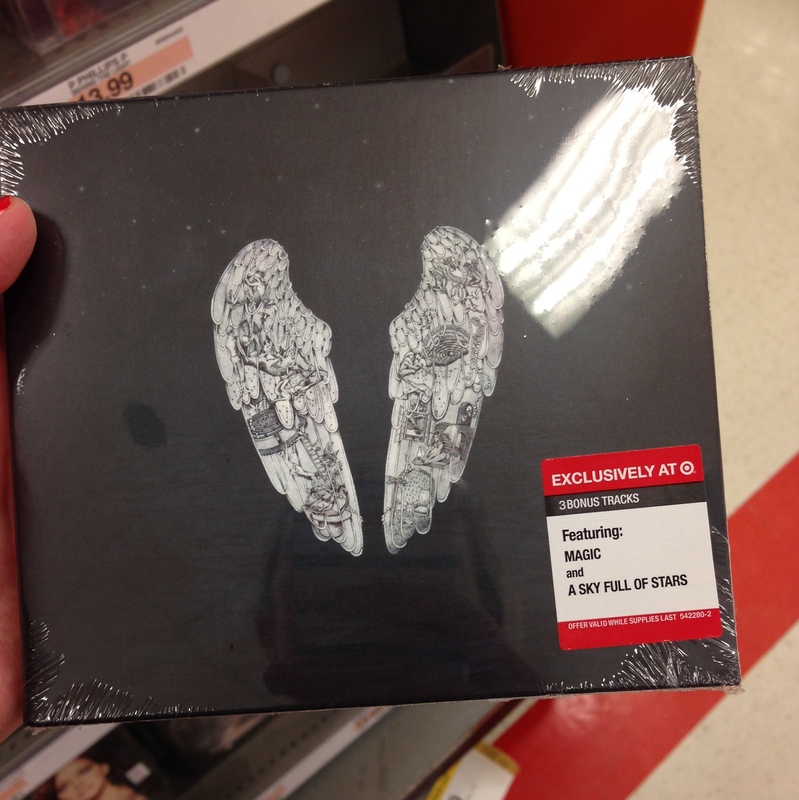 Went to Target Monday morning to get the new Coldplay CD Ghost Stories (yes, I bought the CD, I didn’t download the album!). I have to say – I don’t love it! It’s a bit sad and ballad-y, what did you think? I had some friends over Tuesday night to celebrate one of their birthdays. 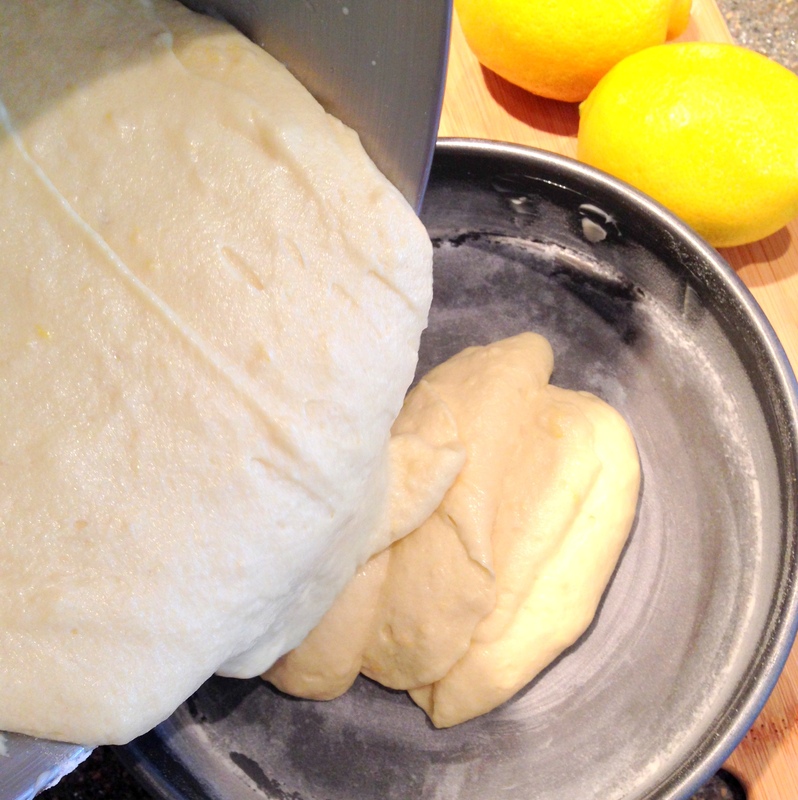 My Z and I made a lemon cake using this Martha Stewart recipe and a basic cream cheese frosting recipe. 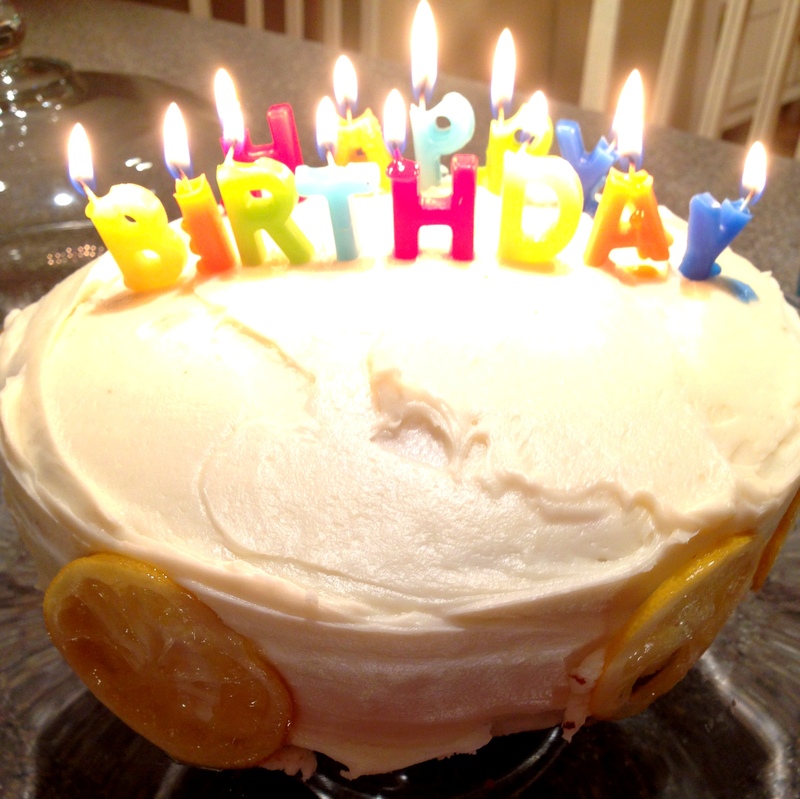 …this was the end result after I got the candles back – it was SO good! I had some pampering to celebrate Mother’s Day last weekend…got my haircut and a nice, relaxing pedicure! Did you know I get a freshly picked bouquet of dandelions almost every day? 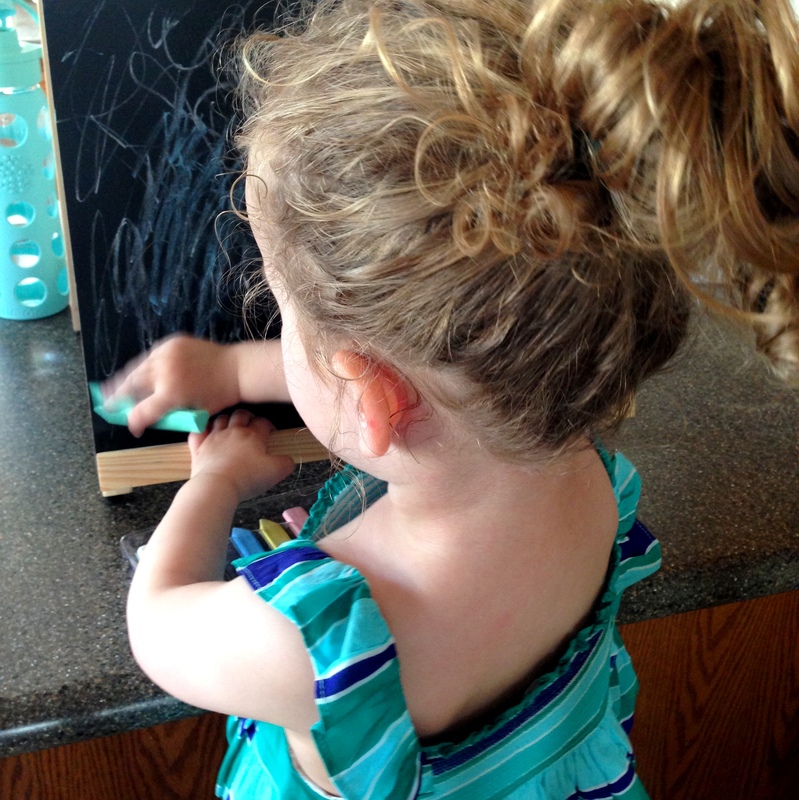 She is obsessed with her chalk board this week. 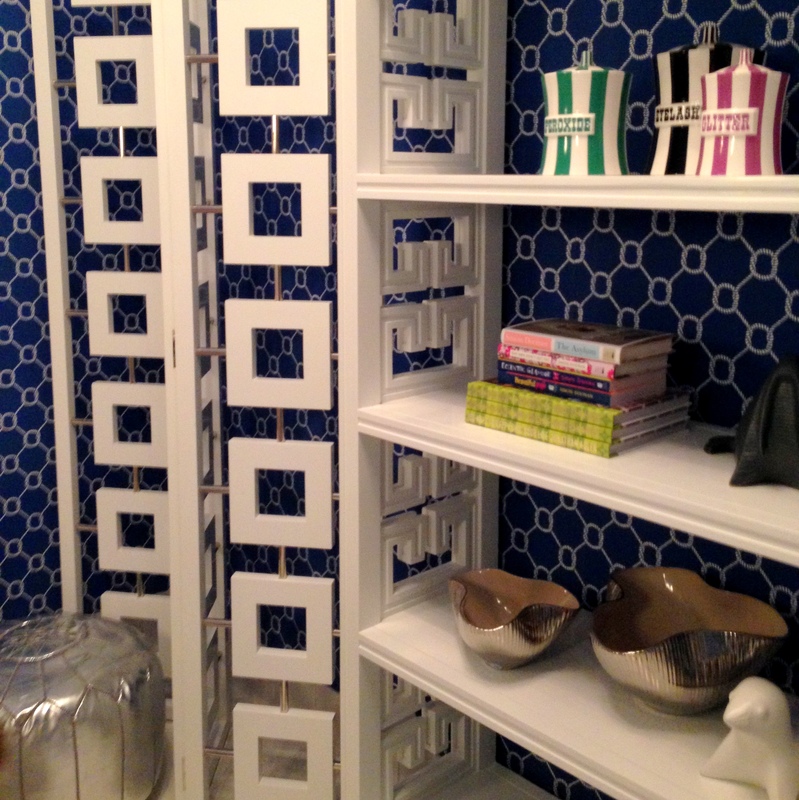 We popped into the new Jonathan Adler store in Chestnut Hill – even the bathrooms were immaculately decorated. 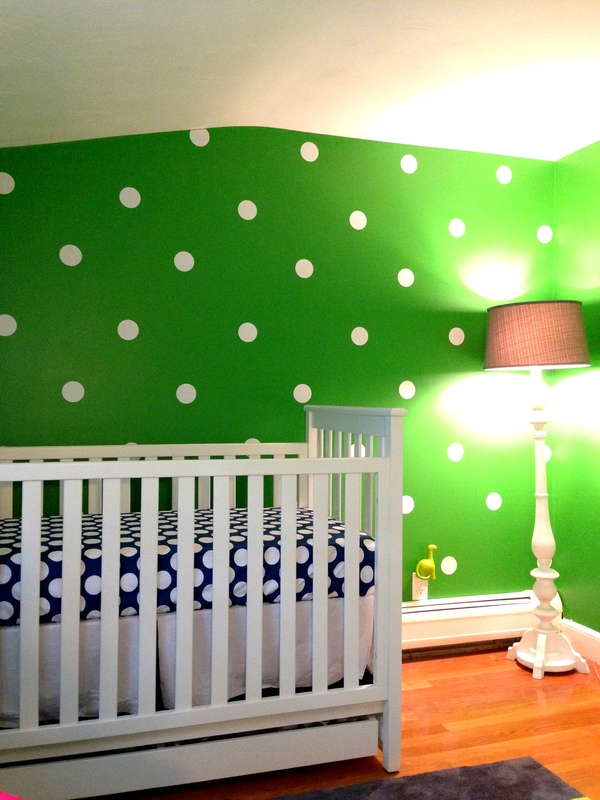 Prepped some white polka dot wall decals for the baby’s nursery….I thought I’d be done in time to share photos this week, but I have more to do so next week it is! 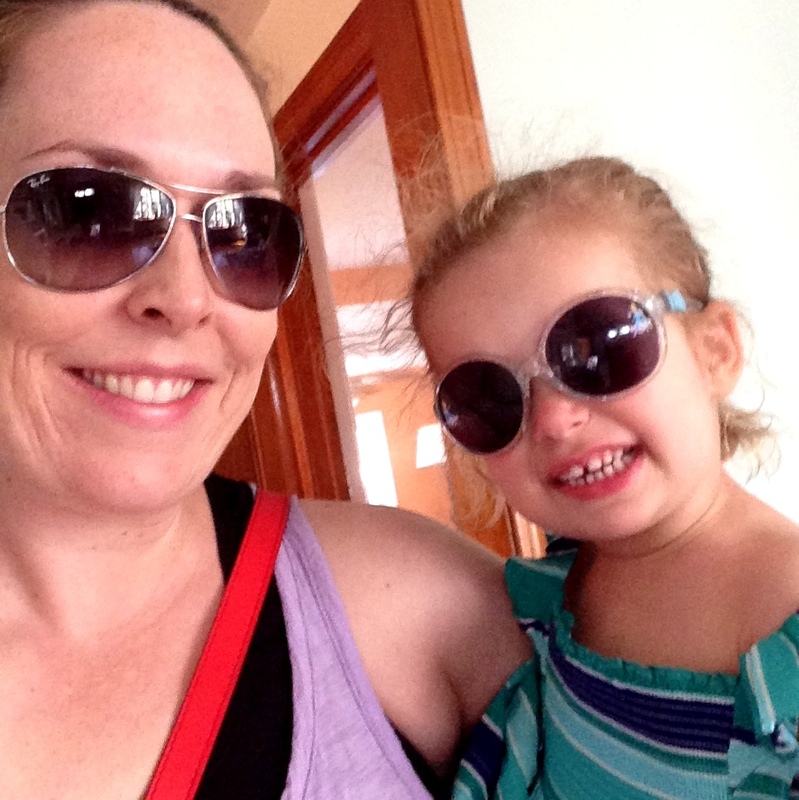 Sunnies – it felt like summer this week! 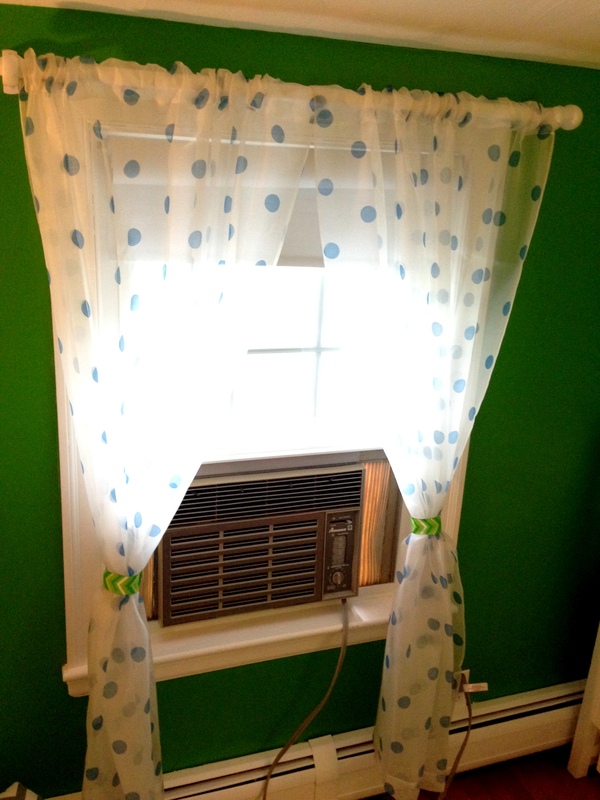 Spending your day with a toddler can be unbelievably entertaining. 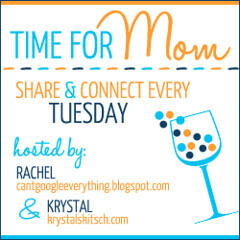 I won’t sugar-coat it, some days are frustrating – when your toddler is full of tantrums and rage, absolutely nothing makes her happy, and she won’t listen to a word you say – this was our day Tuesday, but we can talk about that another time. Back to entertainment… My Z has been chit-chatting up a storm lately and what comes out of her mouth is sometimes unintentionally hilarious. I thought I’d share a few of them with you today. I love Instagram and my Z will often say “more pictures” which is her way of asking to snuggle up and scroll through with me. We talk about what we see in the photos – lots of flowers, shoes, kitties, cupcakes and after almost every picture… “I yike (like) pink shoooz,” “I yike (like) kitties”… Someday when she has her own IG account she will literally “like” every photo! Whenever my Z needs a snack she runs to me and yells “I hun-gee” while patting her tummy in a circular motion at the same time. Visuals do help. Ps. 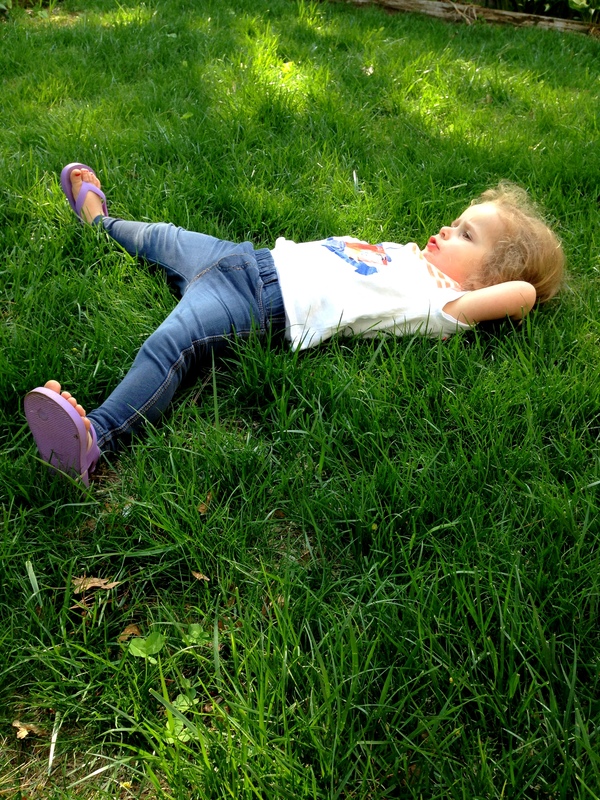 the photo above was taken yesterday when she was singing/screaming “Let It Go” at the top of her lungs in the backyard while laying in the grass. I love Marimekko prints – as evident if you ever come to my house and see this large (I mean large) Marimekko print hanging in the dining area of our kitchen. 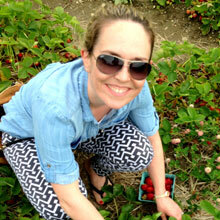 Marimekko is a Finnish design house that is known for making prints using bold colors and patterns – exactly my style! So, you can imagine how excited I was to hear about the new Banana Republic Marimekko Collection that comes out May 22nd. 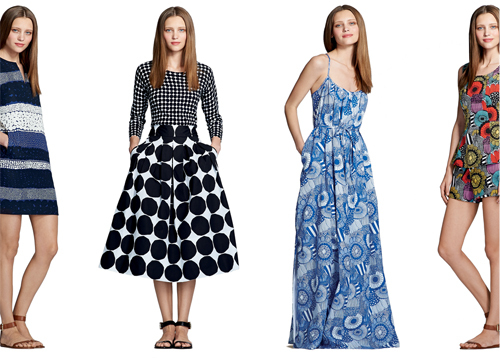 The collection consists of 5 distinct Marimekko prints created by 3 different designers. 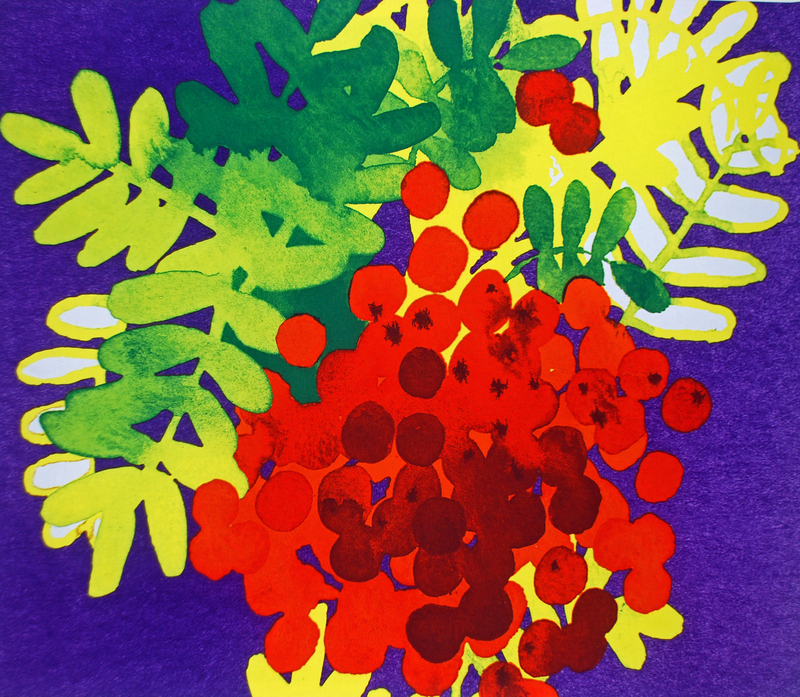 The prints were pulled from the Marimekko archives. I just LOVE the big polka dot print (called Kivet) and especially the colorful print on the far right (called Siirtolapuutarha). Happy shopping!